We still don't know what dark matter is, but new research has brought us closer to figuring out where it might sit. According to astrophysicists from Australia and Spain, the starlight that lingers between massive clusters of galaxies is a giant signpost that as good as says "DARK MATTER IS HERE". In fact, they claim, it's more accurate than any dark matter mapping method developed to date, and could help astronomers understand this mysterious and invisible source of gravity. "We have found a way to 'see' dark matter," said astrophysicist Mireia Montes of the University of New South Wales in Australia. "We have found that very faint light in galaxy clusters, the intracluster light, maps how dark matter is distributed." Dark matter has long perplexed astronomers. We know that there is something out there, interacting gravitationally with the normal matter in the Universe - in fact, its effects are so strong that this mysterious matter is estimated to constitute up to 85 percent of all matter. But we can't directly detect it, which means we have to figure out where it is using indirect means. In the case of this new research, that means is the faint, diffuse light between six clusters of galaxies, imaged by Hubble as part of the huge Frontier Fieldscollaboration between the Hubble, Chandra and Spitzer telescopes. This light is called intracluster light, and it's the result of disruptive interactions between galaxies. During these interactions, stars can be ripped free of their home galaxies and flung out into intergalactic space. Once there, they end up in a spot neatly aligned with the cluster's gravitational map. This is also where the majority of the cluster's mass is - in the form of dark matter. "The reason that intracluster light is such an excellent tracer of dark matter in a galaxy cluster is that both the dark matter and these stars forming the intracluster light are free-floating on the gravitational potential of the cluster itself - so they are following exactly the same gravity," Montes said. "We have found a new way to see the location where the dark matter should be, because you are tracing exactly the same gravitational potential. We can illuminate, with a very faint glow, the position of dark matter." 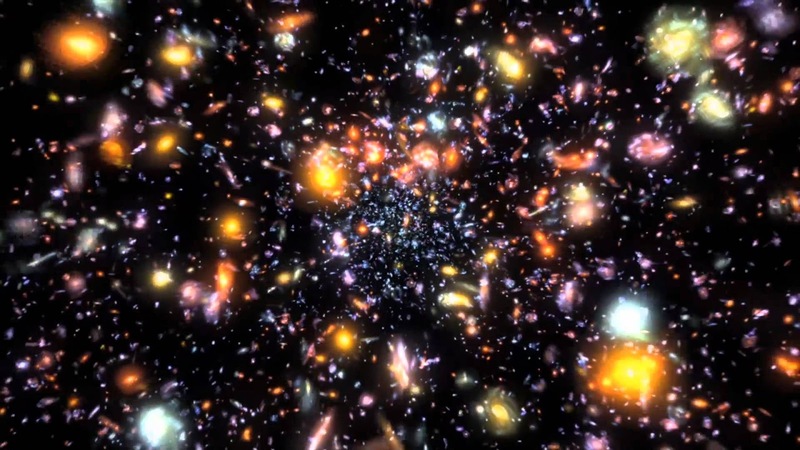 The result means that, just by using deep imaging observations of galaxy clusters, astrophysicists can accurately map where dark matter is residing. That's way more simple and efficient than the current top method, which uses gravitational lensing, or the way large mass bends the light of things shining behind it. This first requires the presence of a lensing object, and something sufficiently luminous behind it; and then time-consuming spectroscopy on top of that. The team compared their results with previous dark matter maps using gravitational lensing using the Modified Hausdorff Distance, a metric used to match shapes. They found that the contours of the intracluster light "exquisitely" matched the contours of the dark matter maps. So astronomers could, potentially, use this method to survey a greater number of galaxy clusters than the gravitational lensing method, in the same amount of time - speeding up the process of mapping the Universe's dark matter, and moving towards a greater understanding of how it binds everything together. The next step is to take a closer look at the six clusters in the Frontier Fields survey to see if the method holds up and to increase their data. Eventually, they would like to see if it can be used at a smaller scale - on single galaxies. "This method puts us in the position to characterise, in a statistical way, the ultimate nature of dark matter," Montes said. The team's research has been published in the journal Monthly Notices of the Royal Astronomical Society, and can be read in full on arXiv.